Richie Reynolds has every right to hold a grudge against Pompey – but he doesn’t. Signed on a free transfer for minimal wages in 1971, the man battling back from a bad knee injury understood he needed to prove his fitness in order to secure a better financial package. I was awarded a payment which the club had to give me for the disgusting wages they paid me. 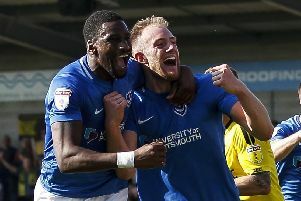 Two years on and with his initial agreement fulfilled, Reynolds had established himself as a firm Fratton favourite – after securing the club’s prestigious player of the year award in his first season on the south coast. Manager Ron Tindall’s gamble had paid off spectacularly but to the player’s dismay, the Blues went back on their word to him. With the club freely spending new owner John Deacon’s money, the striker-turned-midfielder found himself both out of team and pocket when his promised pay rise failed to materialise. A battle in the football courts ensued with aggrieved Reynolds awarded a substantial amount of compensation for ‘derogatory wages’ paid to him. Not exactly – Pompey failed to pay up. Three further years of toing and froing in the courts ensued – as Deacon’s money dried up – before a tribunal instructed the then cash-strapped Blues to release Reynolds from his contract as they couldn’t pay him. To this day, the former England Youth international has not received so much as a penny of the money owed to him. Now aged 67, the man who thrilled the Fratton fans with his long-range shooting is working two jobs to make ends meet and blames Pompey for the fact he is not yet able to enjoy retirement. But such is his loyalty to the fans and the club – rather than those who ran it – Reynolds refuses to hold a grudge. He said: ‘Pompey were very lucky to get me I suppose. ‘I was a promising young player at Plymouth but got a very bad knee injury – I was out of the game for two years and doctors told the club I would never play again. ‘Rather than renew my contract they (Plymouth) just released me. ‘I got myself back to fitness though and went off to Yeovil to help them win the equivalent of the Conference, playing the last six games of the season for them and scoring eight goals. ‘That put me back in the window – clubs had forgotten about me having not played for two years. ‘What do you do? I had just got married and had a mortgage. ‘It was a no-brainer – that was what I had to take, although the wages were a disgrace. More than just prove himself, Reynolds played every game bar one of the Blues’ 1971-72 season, netting 11 goals in the process to be awarded the club’s player of the year trophy. The following season he missed just two league games, flitting between appearances as a striker and midfielder for the Blues. ‘Having played for two years and barely missed a game I don’t think anyone could question my fitness,’ said Reynolds. ‘And after being named player of the year by the fans and been top goalscorer, I felt I was quite justified in earning the same money as everybody else! ‘But it was never forthcoming and never offered. ‘They (Pompey) brought in all of the so-called top players – Peter Marinello, Ron Davies, Phil Roberts, Paul Went. ‘There was a load of them – they were all on £200-£250 a week which doesn’t sound like a lot but back then it was a lot of money. ‘The most I earned at Pompey was £55 a week – and I had been the first name on the teamsheet. ‘In 1973, when we couldn’t agree a new contract, I went to the PFA and took the club to the courts for a football tribunal. ‘I won the case but unfortunately it lingered another three years. ‘I was awarded a payment which the club had to give me for the disgusting wages they paid me. ‘But during those three years, I never got another penny rise – we kept going back to tribunals. ‘They did, for £250,000 – if you can believe that – having signed me two years earlier for nothing! ‘They couldn’t justify the wages to go with it. ‘That is what they did, so I was a free agent in 1976. It’s easy to see why the mention of Pompey may leave a bad taste in the mouth for Reynolds. But the man who made 160 Blues appearances and scored 28 goals in a turbulent five-year stay holds no ill feeling whatsoever towards the club itself. ‘I have moved on,’ said Reynolds. ‘The only disappointing thing is that I am now 67 years old and because of it I am still working. ‘Had I been treated fairly I would have been like all of the others and quite comfortably off. ‘However, I still absolutely loved my five years at Portsmouth. ‘I loved the fans to bits and wouldn’t have wanted to play for any other club at that time. ‘That is until the rot set in and I was treated so badly – worse than any player they have ever had. Look back Reynolds does, though, on happier memories from a mixed time at PO4 – not least proving the doubters wrong. ‘The only dip for me on the pitch was when John Deacon came in with all his money in 1973 and the club thought they were investing wisely with better players,’ said Reynolds. ‘All they did was waste it on a load of has-beens. ‘And what happened when they came in? To justify the money spent they had to leave out the heart of the side. A 0-0 draw at Blackpool in 1975 provided the best demonstration of why Reynolds was a hit with the Fratton faithful. Confidence in his ability was never lacking for Reynolds who thrived alongside some familiar faces in a midfield role for the Blues after initial success up front. ‘I was actually a midfield player, although Pompey signed me to play up front which I did to start with but I was never a goalscorer. ‘I was a battering ram – you talk about statistics in this day and age – I probably would have had more assists than any other player in the country! ‘I used to lay on so many goals and not score them myself. ‘The two best mates I had at Portsmouth were both lads who came from Plymouth before me. ‘One was Nicky Jennings, the other Norman Piper. ‘They were two of the better players in the side as well. ‘I played with some good players at Pompey but unfortunately they were generally past their best. Reynolds left the Blues on a free transfer before the end of the 1975-76 season when the club were relegated to division three. A knee injury at Dutch side Haarlem then brought an early end to his career at the age of 28. Now 67, he is living in Milton, Portsmouth and runs Flutes Cafe on Cosham High Street. Reynolds also owns Double-R-Racing, seeling shares in international racehorses.